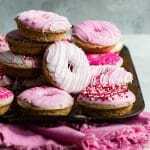 Easy raspberry baked donuts topped with fun Valentine’s Day sprinkles! What could be better? 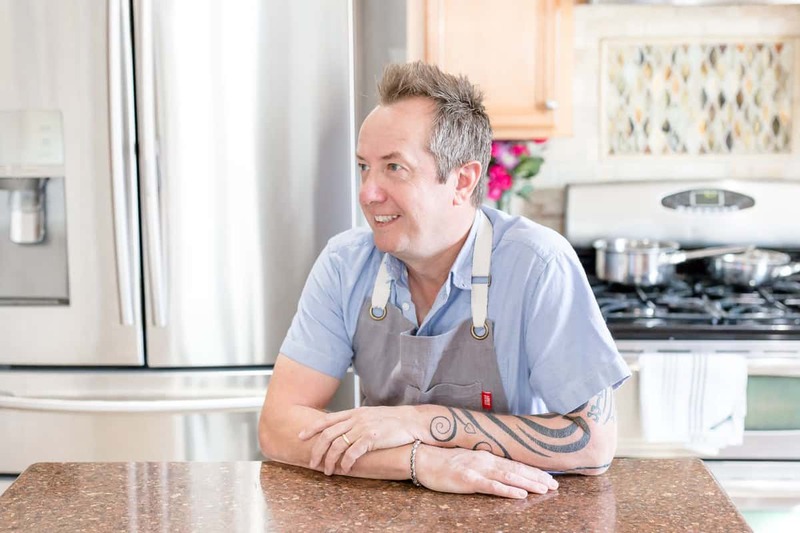 And just like that, Christmas is a distant memory and I’m already posting for Valentine’s Day which just happens to be one of my favorites because I am a big fan of all things chocolate! 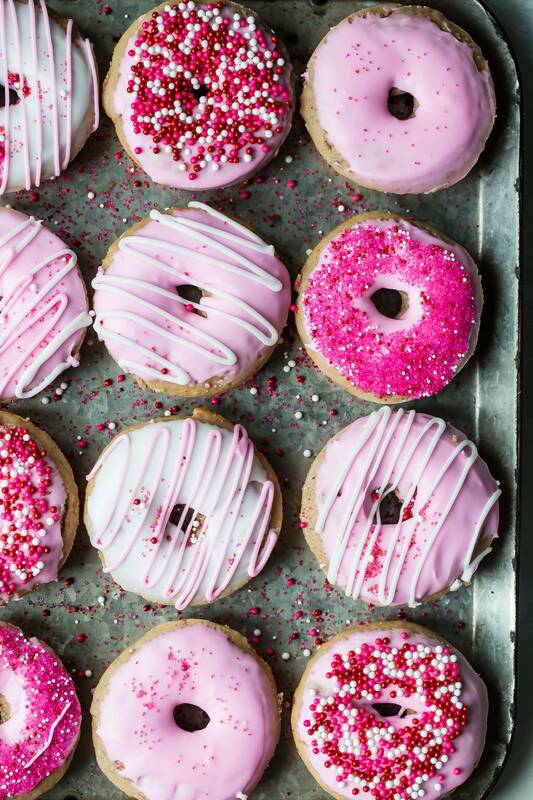 But there’s no chocolate to be seen in these easy-to-bake Valentine Raspberry Baked Donuts. 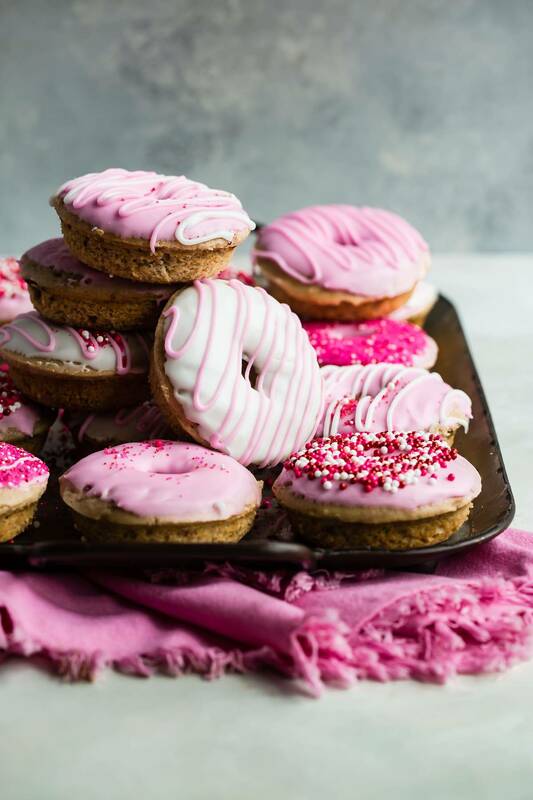 If pink isn’t your thing and you just need a chocolate donut though, you should probably be looking at these Chocolate Brownie Donuts instead. These are baked donuts so no messy oil to deal with or a kitchen that smells like McDonald’s afterward! 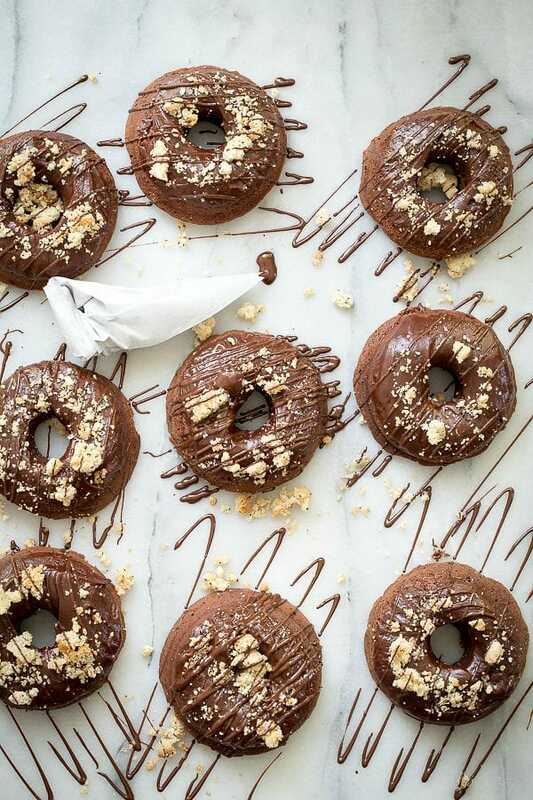 How do I make baked donuts? 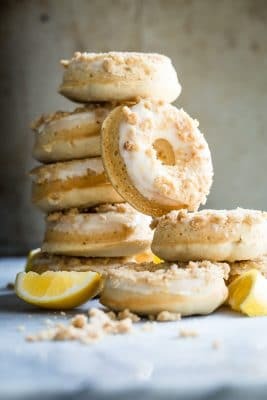 You’ll need a stand mixer because the batter can be really thick at first and it has to be mixed well or you’ll end up with lumps in your donuts and nobody wants that. Once the batter is ready, it’ll still be on the thick side so I prefer to pipe the batter into the donut pan. It makes it more even and less messy. If you don’t have a piping bag, you should add one or two to your kitchen drawer because they can be pretty handy. Filling a ziplock bag and snipping off the corner eventually will make it pop sending batter or frosting all over your hands, trust me! Do baked donuts taste the same as fried? I’m not gonna lie friends, no they don’t. Baked donuts are like mini bundt cakes but who cares because bundt cakes are awesome and they’re not saturated in hot oil. I’m not knocking real donuts but baked donuts are healthier, so there’s that if you are counting calories. At the end of the day, a donut is a treat and should be chosen wisely! How long do baked donuts last? I’d say no more than one day. They’re best eaten straight away but if not, try and keep them covered and you might get two days out of them. They can dry up really quickly because…you guessed it, they’re not full of oil! What can I dip my baked donuts into? This is the fun part. I just used a traditional powdered sugar, milk, and vanilla glaze. But you could also use chocolate ganache, dulce de leche, raspberry glaze or cinnamon sugar. 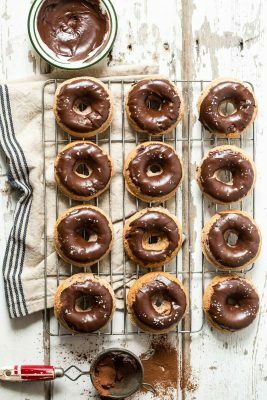 Check out these other donut recipes I think you’ll love! 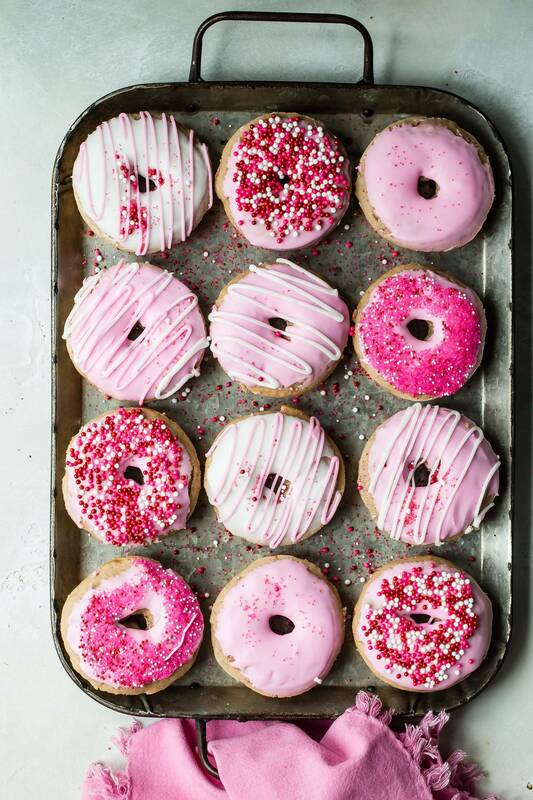 Fresh Baked donuts with pink frosting and Valentine's Day Sprinkles! These are fun to make and even more fun to eat. Spray a donut pan generously with nonstick spray. Using a stand mixer, cream the butter and brown sugar until creamy, about 4-5 minutes on high speed. Add the eggs one at a time scraping down the sides of the bowl as you go. Gradually add the flour to the bowl on low speed until all of it has been incorporated. Add the vanilla, raspberry jam, milk and yogurt, and mix until well combined making sure to scrape down the sides of the bowl as you go. 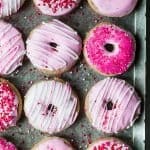 Using a piping bag, fill the spaces in the donut pan and bake in the oven for about 12 minutes and the top of the donuts are slightly springy. Let the donuts cool for 5 minutes and then carefully lift them from the pan to a wire cooling rack. Repeat with the rest of the batter making sure to spray the pan before you fill it each time. To make the glaze combine the powdered sugar, milk, vanilla, and red coloring with a fork in a microwave safe bowl. Heat in the microwave for about 20 seconds or when the glaze becomes slightly runny. If the glaze is too thick when you dip a donut into it, just add some more time in the microwave mixing with the fork afterward. 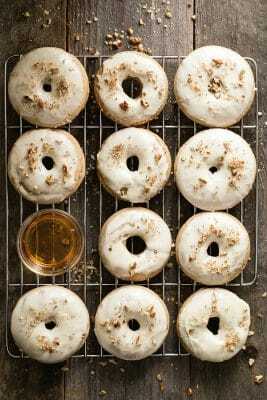 Dip each donut into the glaze while gently taking off the excess glaze with a finger or spatula. Make sure to dip the donuts into the sprinkles when the glaze is still warm or they won't stick as well. Repeat until all the donuts have been glazed and decorated. These are so pretty! I can’t wait to try them! I love your blog! I’ll take a dozen of these pink beauties! Yes please, these are baked perfection!